Where does your pet sleep? If you can’t imagine not cuddling up with your furry friend at night, you aren’t alone. 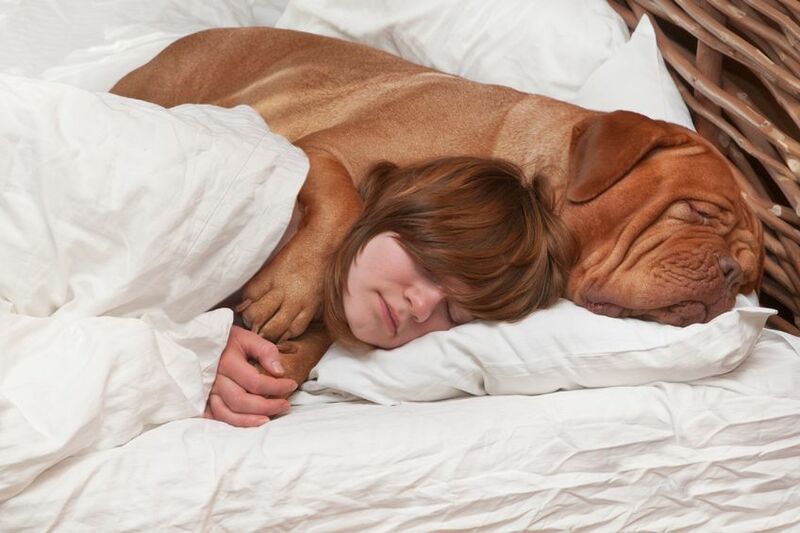 According to the CDC, of the 165 million cats and dogs in our nation, an estimated 62% sleep in bed with their owners. While safety and diminished quality sleep is often debated, it’s important that we all do what’s best for our families, and our snooze. In fact, The New York Times revealed that there are some benefits of keeping Fido close. Even though pets aren’t human, touching and snuggling up to them raises levels of oxytocin in the body, producing feeling of happiness. Plus, when you are lonely, anxious or depressed, the emotional bond that you have with your furry best friend provides comfort, security, and relief. So we say, if you are going to tuck in with your pet, why not make sure you both can collect high-quality sleep to prepare for the next day? First consider your mattress. Is your mattress big enough for the both of you? Does it bounce? Four restless legs running across your back isn’t going to bring sweet dreams. Animals have a different sleep cycle than us humans. Invest in a bigger mattress with very little bounce to allow both of you to get comfortable and stretch out. We recommend opting for a memory foam mattress with cooling gel, such as Gallery Furniture’s exclusive Mack-O-Pedic. If you’ve been getting serious about creating a sleep promoting bedroom with improving your sleep hygiene, then you may have heard the benefits of using a fan or white noise machine at night. The consistent noise not only promotes deeper sleep for us, but for our pets. Just as we become distracted by outside noises, including our snoring furry friend, our pets may be more interested in the sound of an ambulance driving by than stacking up on snooze. Whether you share your room with dogs, cats, pigs or monkeys, there is a way to ensure you are sleeping your best. Adults need 7-9 hours of sleep each night to start each day with optimism, energy and happiness. Snuggle up with your four legged friends and collect of the benefits of quality shut-eye tonight!